Think homemade fudgsicles gone gourmet! 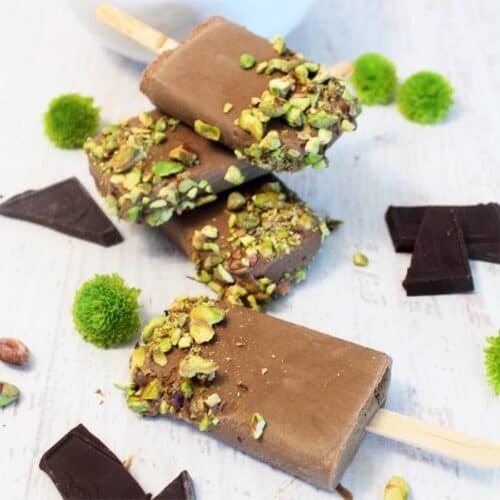 These easy 4-ingredient Chocolate Pistachio Popsicles are perfect for hot summer days and backyard BBQs. Blend all ingredients in blender and pour into popsicle molds. Freeze for 1 hour then add popsicle sticks. Freeze until hard, about 2-3 more hours. When ready to serve, take out of freezer and run mold under a little hot water to loosen. Remove from mold then dip immediately into a plateful of chopped pistachios (which is totally optional but oh so good!). You can also coat with toasted coconut, sprinkles or even drizzle with white/dark chocolate.